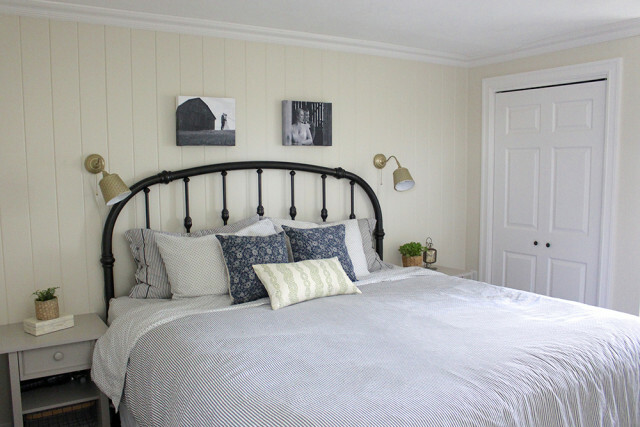 One Room Challenge Week 6: Farmhouse Master Bedroom Reveal! 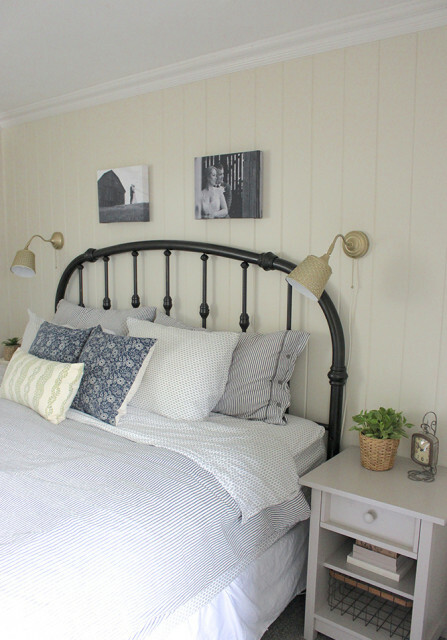 I am SO excited to share today’s reveal for our farmhouse master bedroom. 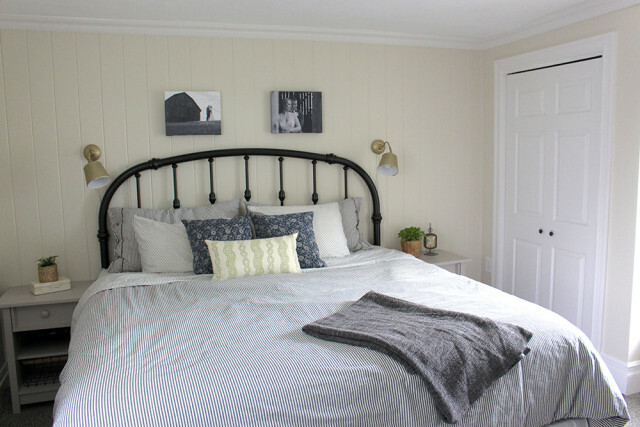 For the last six weeks I’ve been making over our master bedroom for the One Room Challenge hosted by Calling It Home. Back in April, I shared the plan and it’s been a race to make those dreams come true. But wow – was it ever worth it seeing everything come together this week. At the end of this post, you can see all the previous weekly updates. Seeing as it was our third wedding anniversary yesterday when we finished the room, it seemed fitting that we made this project our gift to each other. Having our own haven away from the chaos of the rest of the house is such a lovely luxury right now. 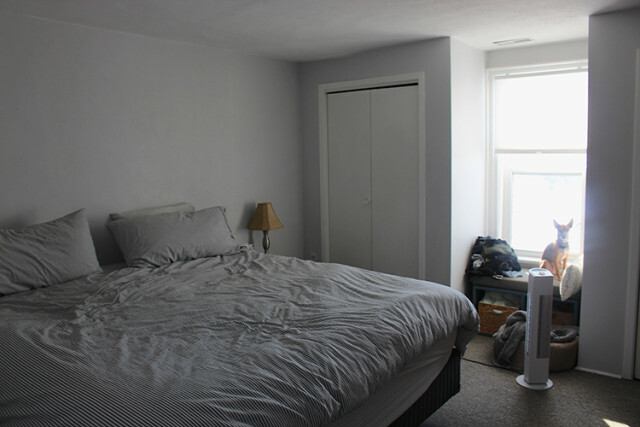 To refresh your memory, here is what the bedroom looked like when we started out. 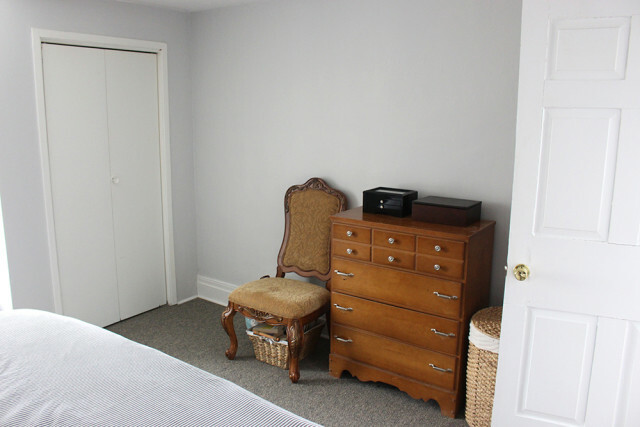 We know the closets were a later addition to the room, as you can see the original baseboards in the back of them. Here is what they looked like before the renovation. Now they fit right in with the style of the rest of the house with the beautiful trim from Metrie. 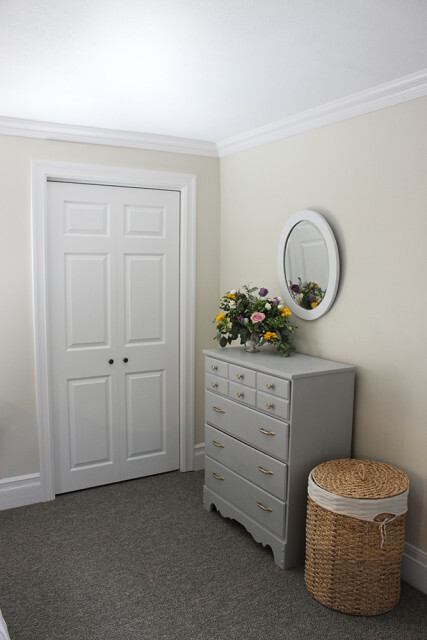 The new door casings, baseboards, and crown molding completely transform this space. 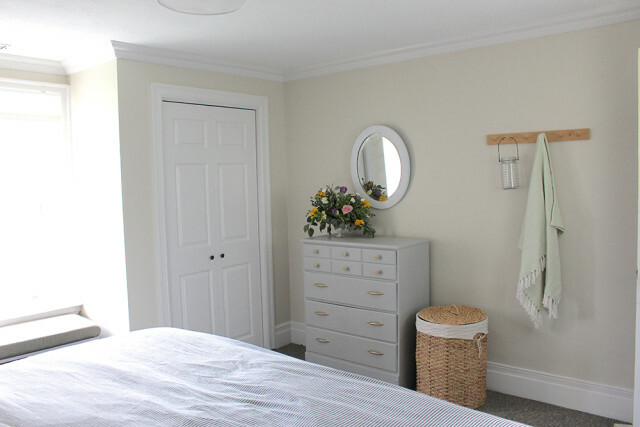 The old particle board doors were replaced with new six panel bifold doors from Masonite, available through Metrie. Across from the bed we always had an old chair, dresser and our hamper. It was always a real catch all for laundry and junk. Now it’s so bright and airy! I tried to keep everything light and refreshing. I repainted the dresser and repositioned the handles. The antique mirror from my great aunt’s farmhouse got a new coat of paint too. The hooks were from in the closet of our old apartment, but are perfect here as a place to hang a sweater I’m going to wear the next day, or a throw blanket in the cooler months. 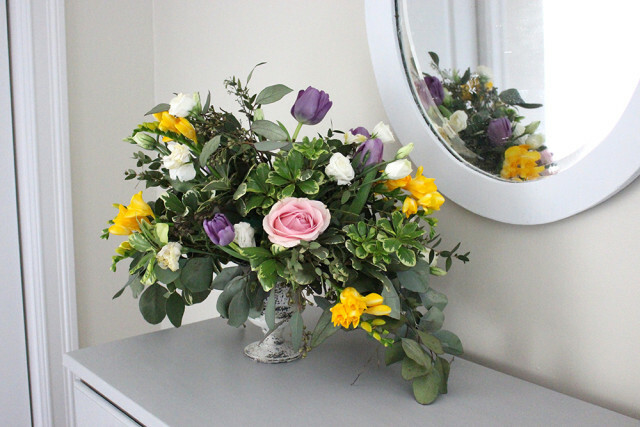 The dresser is also the perfect place to showcase the new flower arrangement I made. I’d love to have one of our Cloverhill Flowers bouquets on here all summer long. The benefit of being a flower farmer! 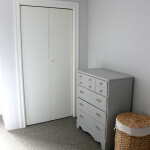 I am over the moon with how well the closets turned out. Before we started, they were beat-up old hollow slab doors with a simple thin casing around them and quarter round trim on the bottom. Now they stand out and make the room feel stately. I decided to place two knobs on the inside, instead of the traditional one knob on a bi-fold door. It gives the illusion that they’re french doors. 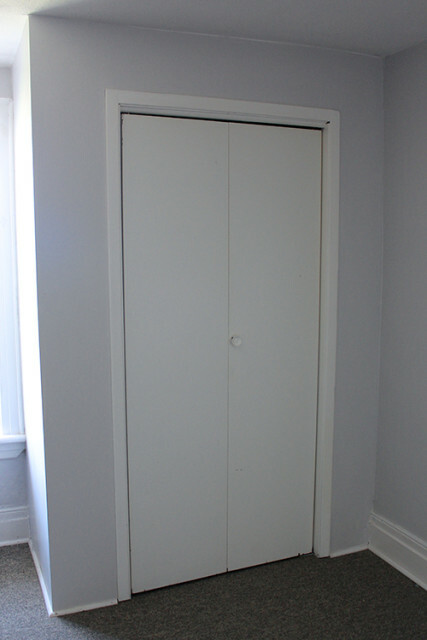 You can see here how the closets had originally been framed out with quarter round on the bottom. 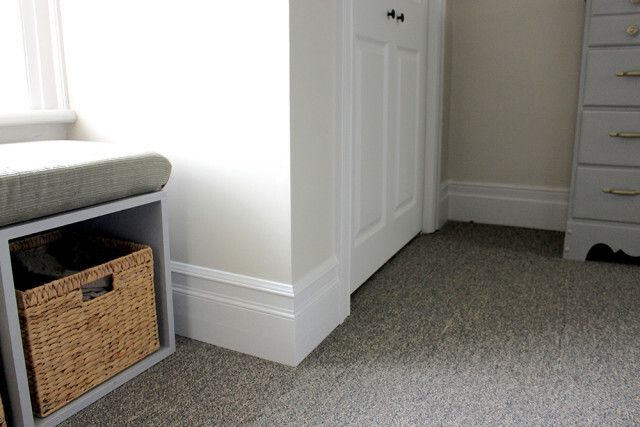 The new thicker baseboards blend in perfectly with the original baseboards throughout the farmhouse. 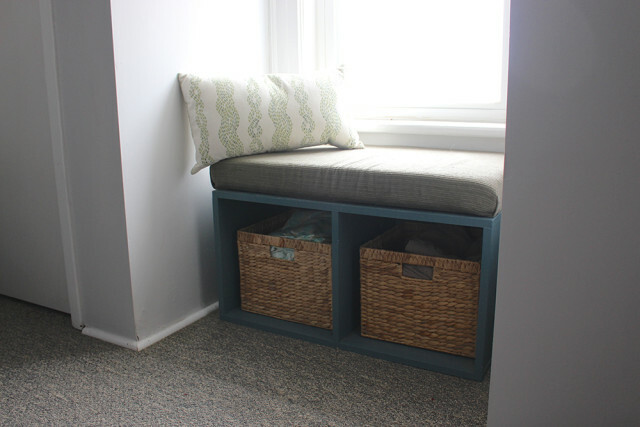 I also gave the window seat a fresh coat of lighter paint with Rustoleum‘s Chalked Paint in Aged Grey. 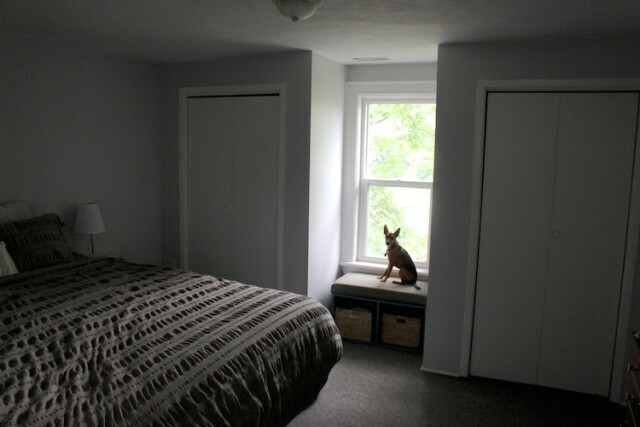 You can see the original baseboards here along that back wall and the newer baseboards by the window seat. 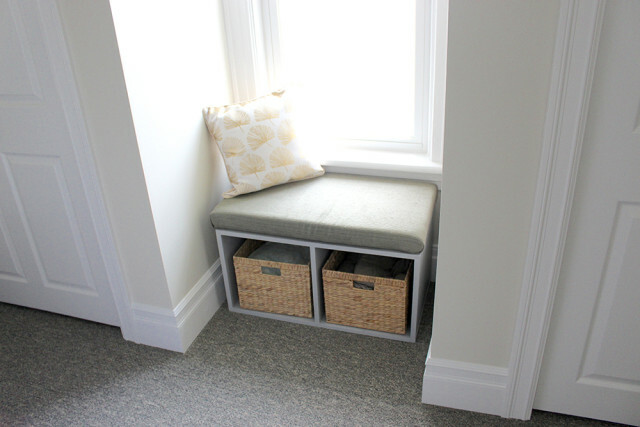 To make them fit at the same level as the original ones, we added a piece of MDF along the bottom that fit perfectly flush with the new Metrie baseboards. 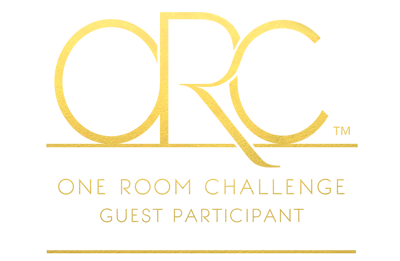 Using some putty, I was able to blend the two pieces together seamlessly on the walls, creating the illusion of a thicker baseboard. 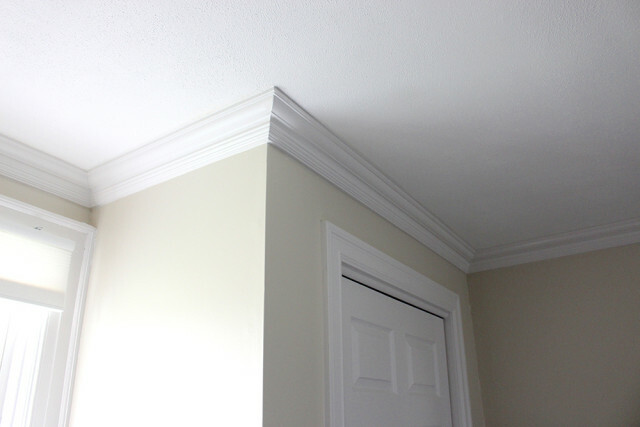 The crown molding may just be my favourite part. 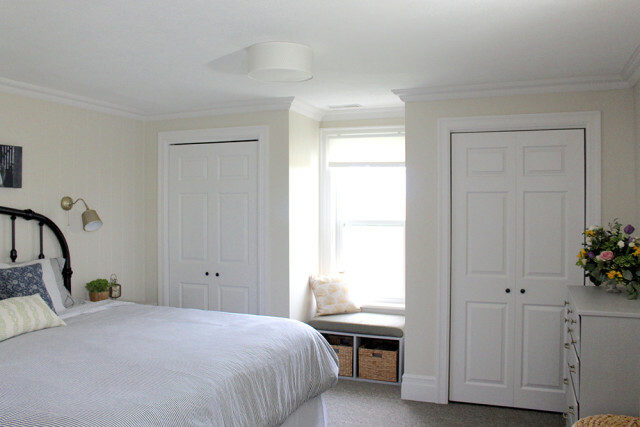 Our 114 year old plaster walls and ceiling didn’t always meet in a perfect line, so adding crown molding gave it the illusion of being perfectly straight. …to oil rubbed bronze! 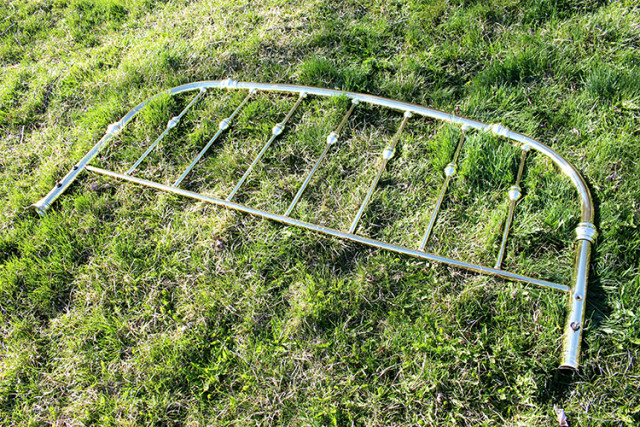 I love the finish we were able to get with the Rustoleum Universal spray paint. You’ll never guess what we used to prop it up a little bit higher to sit level with the bed – black PVC pipe. You can’t see it behind the bedframe and it blended in perfectly while giving the headboard some extra support too. The wrapped canvas frames above the bed are of two of my favourite pictures from our wedding. I love having a place to display them now. 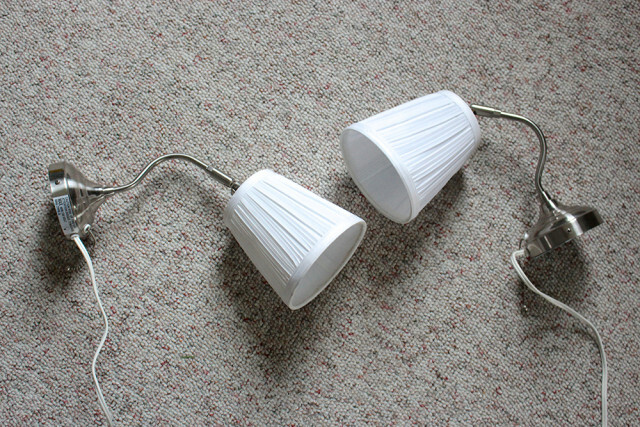 These wall lamps were from our last apartment, but were in need of an update. 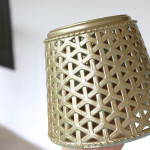 Some gold spray paint and a new lampshade made out of a flower pot gave them a whole new look. 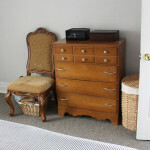 The nightstands were a great find from Hayneedle. I love how they fit perfectly next to the bed, while still leaving enough room for the closet door to open. The little wood and metal baskets below are a great spot to stash a book or a few toys to keep Lucy busy while I’m getting ready in the morning. 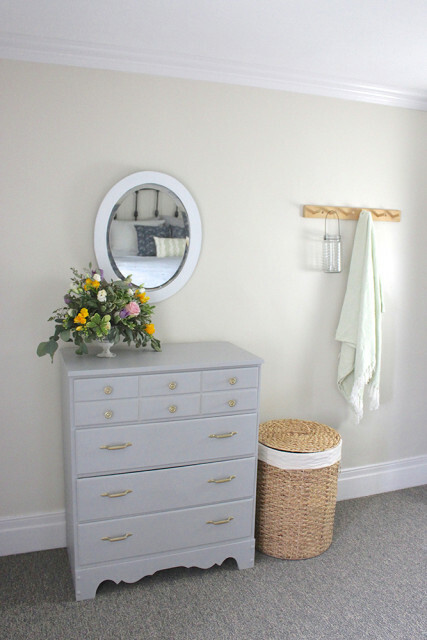 Thank you so much for following along on our journey to makeover our master bedroom. It’s been a fun experience and I can hardly wait to tackle our next space in the farmhouse. Disclosure – A big thank you to Metrie, Rustoleum and Hayneedle for sponsoring this project. All opinions are my own. 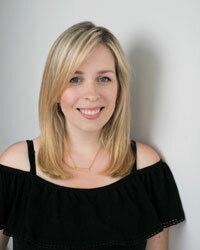 Check out the One Room Challenge blog to see all the other participants as well. Thank you Jane 🙂 Hopefully sometime when you’re visiting mom and dad you can come over and see it in person. Wow! Everything looks so bright and lovely! Wish I had the talent to do all that. Love how the crown molding looks! Thank you! I’m loving the space. We were so lucky to get help from our family to tackle these things. 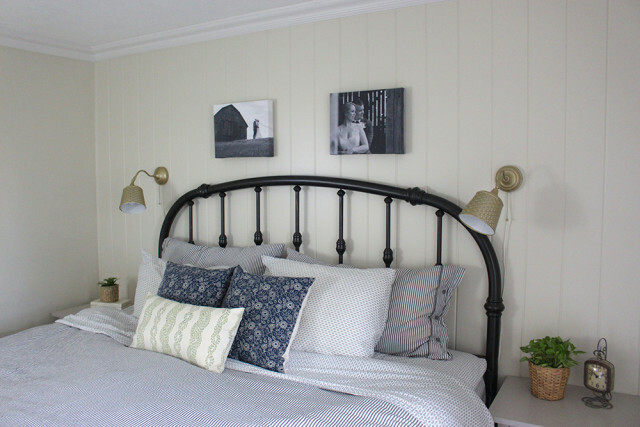 the headboard looks so great in black against the wall, and i love the sconces as well! 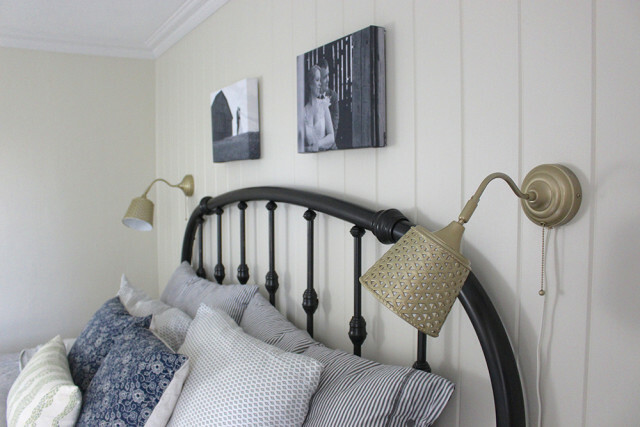 Love how your headboard turned out…..I am trying to muster up the courage to do the same to mine….this just may make me do it! 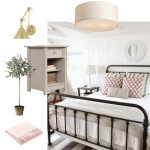 Sweet and simple and beautiful .love this room and love the neutrals . Great job ! I like everything about the room, especially how you repurposed items. 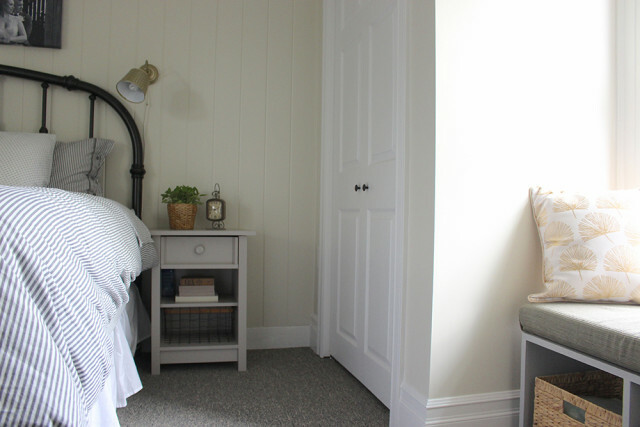 I just love all the DIY touches in your bedroom, and I never would have guessed that those were two different baseboards unless you told me! All your hard work and the end result looks FANTASTIC! Time to get out and play in the flower field. And then there’s farmers market. In your spare time ( HaHa) try and find a novel called the ” The secret language of flowers” will look up the author for you. Might make you arranging more interesting? Hugs, your Colorado connection.